On Christmas Day, Sir David Attenborough presents the Christmas shearwater. On Christmas Day, Sir David Attenborough presents the Christmas shearwater. 2000km south of Hawaii the highly marine Christmas shearwater is at home over the Central Pacific seas, tirelessly riding the air-currents, skimming wave-crests and hugging the contours of the sea looking for food. They rarely come to land as adults, but when they do, it is to return to their place of birth on remote oceanic islands to breed. Here they form loose colonies, laying a single white egg which is incubated for around 50 days. 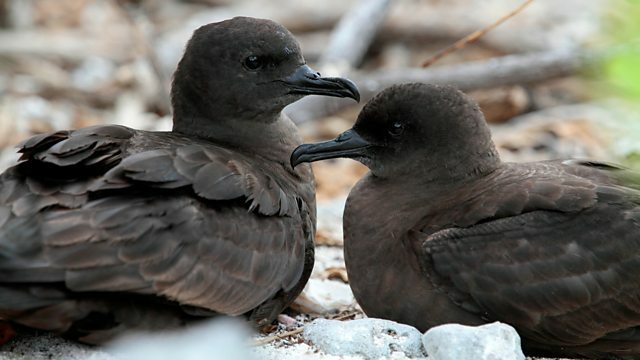 Inhabiting these far flung inaccessible islands means little is known about their biology, but that remoteness gives them protection from land based predators. This programme contains a wildtrack recording of the Christmas shearwater kindly provided by The Macaulay Library at the Cornell Lab of Ornithology; recorded by Alvaro Jaramillo on 4 Mar 2004, in Motu Nui, Rapa Nui, Valparaiso, Chile.